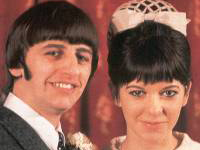 Ringo Starr and Maureen Cox were married on February 11, 1965 at Caxton Hall, Westminster. Attendees at the wedding included: Brian Epstein (best man), parents of the bride and groom, John and Cynthia Lennon, and George Harrison. Mary Cox was born in Liverpool, England, the only child of Joseph Cox, a ship steward, and his wife Florence Barrett. Mary left school at 16 and changed her name to Maureen when she began her career as a trainee hairdresser in Liverpool. She was also known as “Mitch” to her friends. In a 2007 interview on a promotional disc for his 3-DVD set, “The McCartney Years,” Paul McCartney revealed that Maureen had been his girlfriend before she was Ringo’s. Maureen’s life became regularly threatened when some of the fans figured out that she was dating Ringo. She was viciously scratched on the face by a fan on Valentine’s Day in 1963 as she was waiting in Ringo’s car outside the Locarno where The Beatles played that night. She got the window up just in time or she feared she would have been killed. Previously, in September 1963, Maureen, with her parents’ permission, had holidayed in Greece with Ringo, Paul and Jane Asher – their last peaceful and anonymous vacation before the Beatles’ fame made privacy impossible. In Liverpool, Maureen had assisted at the Beatles Fan Club since 1962 and answered lots of Ringo’s fan mail. Parents would write back thanking her for being so nice to their daughters. After their Caribbean holiday, Ringo introduced Maureen to the press, announcing she was now his private secretary and would be helping his parents with his personal fan mail. In June 1964, Ringo collapsed, suffering from tonsilitis, at a photo studio just before tours to Amsterdam and Australia. Maureen and Ringo’s mother rushed from Liverpool and stayed at his London flat until he was released from the hospital, free to join The Beatles on the remainder of their Australian tour. In December 1964, Maureen was by Ringo’s side when he went back into the hospital to have his troublesome tonsils removed. She secretly visited and brought him ice cream, remaining with him in London through Christmas. By January 1965, Ringo went down on one knee and proposed to Maureen at the Ad Lib Club in London. She had been a Beatles fan – kissing Paul before falling for The Beatles‘ drummer. The 18-year-old Cox married Ringo Starr on February 11, 1965. Their first child, Zak Starkey, was born on September 13, 1965. (Zak was followed by Jason on August 19, 1967 and Lee on November 11, 1970). During this time, Maureen was very much a part of Ringo’s life, and they did everything together. She sang backup vocals on “The Continuing Story of Bungalow Bill” and was, along with Yoko Ono, in attendance at the rooftop concert in 1969 (Paul can be heard saying “Thanks Mo”). The very first song in The Beatles‘ Apple Records catalog was a special private recording sung by Frank Sinatra as a favor to Ringo Starr as a 22nd birthday gift for Maureen in 1968. Sammy Cahn rewrote Lorenz Hart’s lyrics to “The Lady Is a Tramp” and personalized them about Maureen (who was a great Sinatra fan). Sinatra recorded the song in Los Angeles, and only a few copies were pressed before the master tape was destroyed. Ringo surprised Maureen with the one-of-a-kind single on August 4, 1968. Any surviving copies of the disc would be counted among the most priceless artifacts of Beatles/Sinatra memorabilia. A poor quality copy of the song began circulating in collector circles. It is now available on several bootleg albums. In a 2005 interview with Andre Gardner on WMGK Radio in Philadelphia, former Beatles business manager Peter Brown described extensively his role in getting Sinatra to do the record. Cahn plays piano while Sinatra sings the reworked lyrics. They are the only two performers on the song. The Starkey marriage began to unravel over the five years following The Beatles‘ breakup in 1970. Ringo’s infidelities were increasing, his alcoholism becoming more of a problem. To make matters worse, Pattie Harrison found out about George and Maureen’s ongoing affair and proceeded to tell Ringo, which made him furious. One night when the Starkeys were visiting George and Pattie, George told Ringo how much he loved Maureen. Rumors have persisted that this fateful evening led to the breakup of both the Harrisons’ and Starrs’ marriages. Despite all of the marriage problems the couple faced, Maureen Starkey did not want a divorce. Her husband, however, simply wanted out. Maureen unwillingly accepted. On July 17, 1975, the divorce was finalized on the grounds of Ringo’s affair with an American model, Nancy Andrews. In her book “John”, John Lennon’s first wife, Cynthia, wrote that after her divorce from Ringo, Maureen was so upset that she rode a motorbike at full speed into a brick wall and required plastic surgery to repair injuries to her face. They divorced on July 17, 1975 after Ringo had an affair with a US model. Ringo wed Bond girl Barbara Bach in 1981 – and they are still married. Maureen gradually created a new life for herself and the children but the Starkeys remained a family unit. A friend commented: “Ringo never lost that place in his heart for Maureen. He’d only lost that person that fell in love with her.” On the third anniversary of their divorce in 1978 Ringo and Maureen with their children attended a party together setting off press speculation that they were reconciling. Maureen married Isaac Tigrett, of Hard Rock Cafe and House of Blues fame, on May 27, 1989 in Monaco. They had one daughter together: Augusta King Tigrett, born January 4, 1987 in Dallas, Texas.